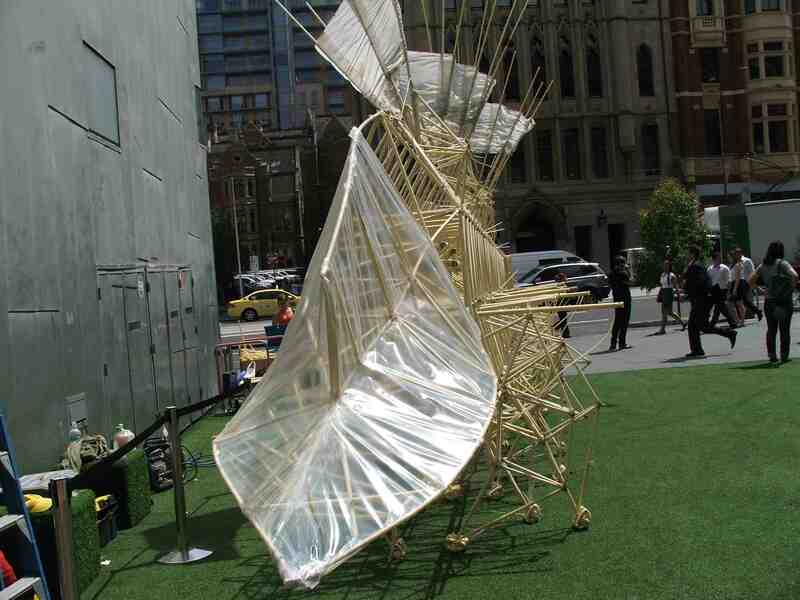 Theo Jansen’s Strandbeests have hit Melbourne, and are currently running loose at Fed Square all of February. I’ve been lucky enough to be one of the beest herders to help keep them happy and healthy, despite the lack of sand. (‘Strandbeest’ meaning ‘beach animal’ in Dutch) I’ve had a ball so far, still a few weeks to go. 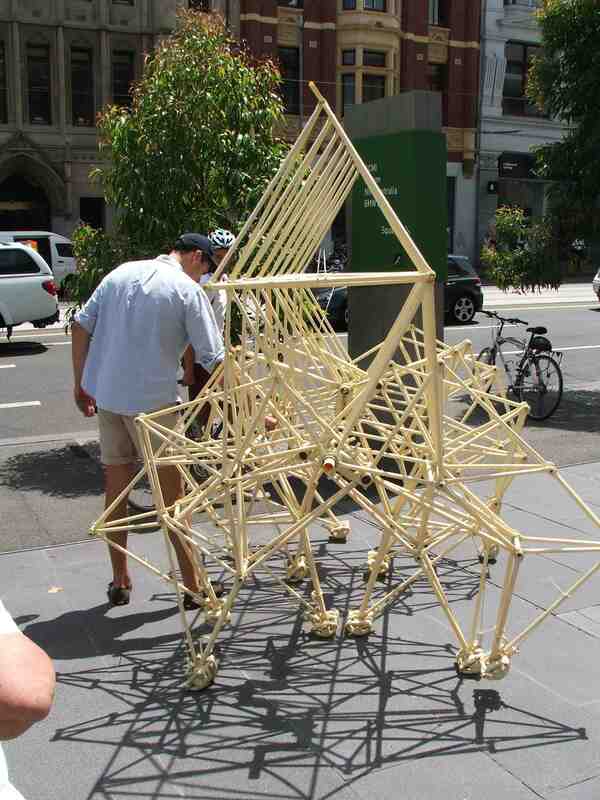 There are two of the Strandbeest family visiting from across the seas. Anumaris Umerus, a 12m long, 4m high and 2m wide behemoth of pvc pipe and bottles. This creature can power itself along the Dutch beaches via compressed air, harnessed by it’s singular wing that runs the length of it’s spine. In the wild it is a sight to behold (as you can see below) While it has had its wing clipped to be taken on tour (Umerus is run on an air compressor) it is still far from being completely tamed. In the daily demos Umerus’s wild nature is never far from the surface.Check out the Fed Square for demo times. Animaris Ordis Mutantis, is Umerus’s smaller cousin, much more docile, more Shetland pony, if you like. Mutantis is a lot more approachable then Umerus, and has been a hit with everyone, young and old, allowing them to take it for a short walk around the square. So if you’re around Melbourne or will be passing through, make sure you come down, say g’day and check them out. 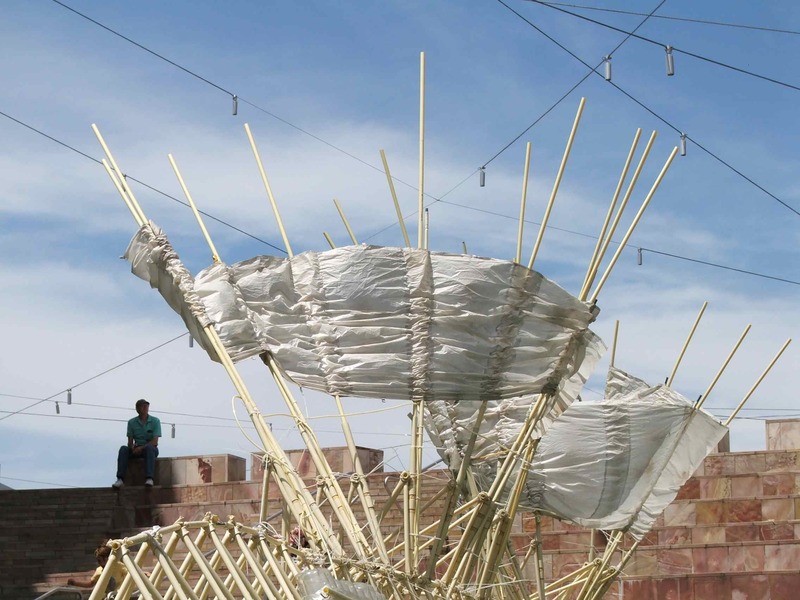 Here’s a few clips to get you interested if you haven’t heard of the Strandbeests already. I saw these on TED last year! So brilliant you got to be involved! Hey Gem, yeh it’s been great to see them in person. They’re pretty nuts. Hope Tassie’s treating you well.